Most interesting jungle farm with a great waterfall, a river and a creek in the middle. 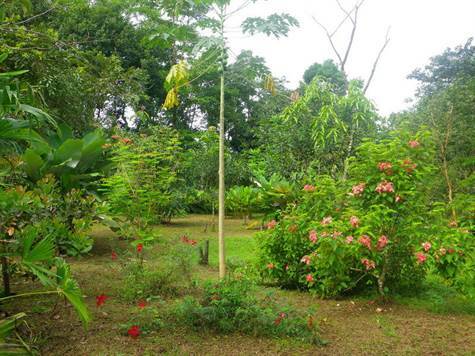 One section is planted with numerous fruit trees (apples, oranges, bananas, plantain, pineapple, cashew, etc. ), 5 hectares of Cocoa trees and the in remainder of the farm you find numerous hardwood and precious wood and other construction wood trees such (cristobal, cedar, ronron, ojoche, corteza, mandrillo, etc.). Some of those trees could be harvested to provide lumber for your buildings and furniture and for some commerce as well while preserving the tropical environment. You have a choice of 3 building areas, one near the river at the entrance where the fruit plantation is, another higher up where you will benefit from the refreshing breezes and the third located next to the river and waterfall, it would be an ideal place for a large family compound or eco-lodge in natural surroundings with all the local flora and fauna which you could explore by developing numerous walking trails to fully enjoy the whole property.